Ah, Twitter. One of the three biggest channels dominating the social media marketing landscape, yet one of the most challenging channels to get right. Every day you see companies stumbling through their feeds, unsure of what they’re doing and whether or not it’s working. This is why using Twitter analytics to gain insight into your performance and improve results is so critical for marketers. Savvy organizations have developed strategies and goals for using Twitter and are considerably more organized than their peers. But the biggest difference is that they’ve learned to leverage every single aspect of Twitter to their advantage, from hashtags to chats to measuring success. It’s analytics that enables true channel insights and brand growth within the Twitterverse. Every action you perform on Twitter can be recorded and measured; from the number of tweets you publish to the amount of content you share. The same can be said of every action performed by others that involves you in some way (e.g. being retweeted). These metrics can be collected and analyzed to provide an in-depth look into what happens to the content you publish Twitter. But these aren’t just vanity metrics that make you feel better about yourself. They serve a very practical purpose, one that can bring your business plenty of value. Twitter analytics can be used to optimize your marketing campaigns by giving feedback on how your message is being received online. Social media marketing campaigns are of course the first thing to spring to mind when we talk about what gets optimized; however, even campaigns that don’t have social media as their focus — like a webinar or tradeshow appearance — can still benefit from supporting Twitter analytics. What should I track to optimize social campaigns? By now marketers like yourself are (and should be) familiar with Likes, Follows, Retweets, and Replies. These entry-level metrics can indeed provide insight into your popularity and reach on Twitter. But great Twitter analytics gives you access to so much more: comprehensive metrics of both overall and individual tweet performance that can unlock greater insights. Total tweets: Total number of tweets published. Impressions: Times a Tweet was shown in a user’s timeline or search results. Likes: Times a user liked a Tweet. Retweets: Times a user retweeted a Tweet. Replies: Times a user replied to a Tweet. Followers: Number of users following an account. Total interactions/engagement: Total number of times a user interacted with your Tweets. This could be replies, retweets, follows, likes, clicks on a Tweet, hashtags, links, downloads, profile photo, or Tweet selection. Interactions/engagement per Tweet: Average number of interactions per Tweet. Likes per Tweet: Average number of likes per Tweet. Retweets per Tweet: Average number of retweets per Tweet. Change in followers: Variation in total number of followers for a given period of time. Percent change in followers: Percentage variation of total number of followers for a given period of time. URL clicks: Times a URL embedded in a Tweet was clicked. Hashtag clicks: Times a hashtag used in a Tweet was clicked. Detail clicks: Times a Tweet’s detail button was clicked. Permalink clicks: Times a Tweet’s permalink was clicked. Media clicks: Times the media attached to a Tweet was clicked, whether photo or video. App install attempts: Times an app installation was attempted via its Tweet Card. App opens: Times an app was opened via its Tweet Card. Tweet emails: Times a user emailed a Tweet to another person. User profile clicks: Times user profile was clicked. User follows: Times the Follow button was clicked on the User Profile. Video views: Times video embedded within a Tweet is viewed. All these metrics may seem excessive, but you’ll be surprised at how quickly these become essential to optimizing your social media marketing efforts, especially when it comes to setting marketing benchmarks. For example, by comparing the number of impressions against the number of clicks in real-time, you can tell how engaging each piece of content is. Over time, you’ll be able to refine your assets (and the messaging used to promote them) to better connect with audiences and drive stronger engagement. This will work for videos, weblinks, app downloads, and more. You can learn even more by looking at historical performance, competitive data, and comparing Twitter metrics against those of other channels. These reports can be automated to track and record performance over time. 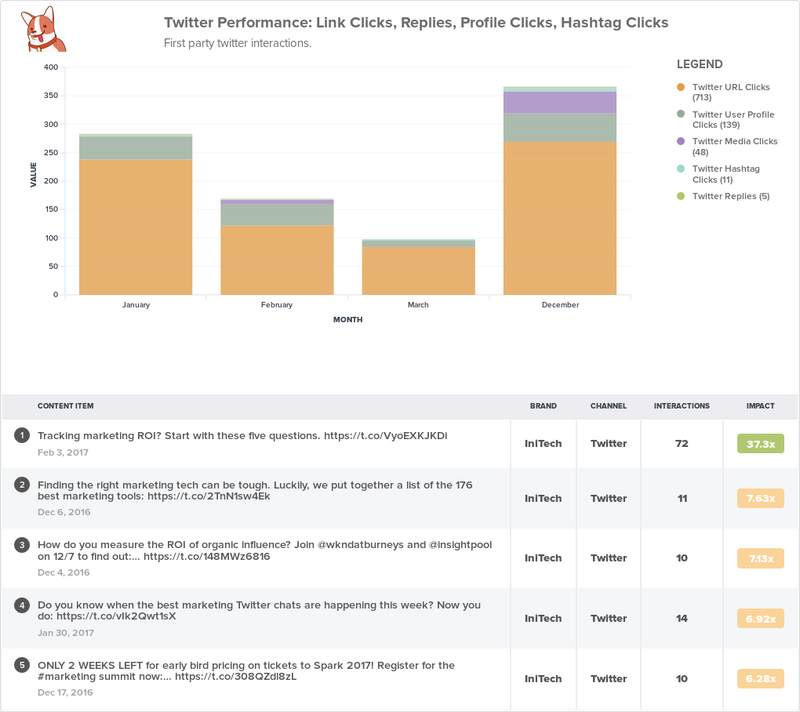 How can Twitter analytics improve my brand performance? So we’ve spoken about optimizing social marketing campaigns; but what about your brand performance in general? Twitter is not the only channel in the social media marketing sphere; nor is social media the only component of your overall brand strategy. And yet Twitter is unique in that it provides regular, instant communication with the public at large — customer or not. Through Twitter, brands can increase their visibility, deepen customer relationships, and even drive sales. Twitter analytics helps you focus on the campaigns that work, and helps you discover just what it is about your brand that people value and connect with. Engagement metrics show what your audience responds to, and monitored conversations around your brand can expose the discrepancy between your own perceived brand value with the audience’s perception of you. This is especially important when it comes to tracking your competitors and influencers on Facebook, so you can stay ahead of the pack. By staying alert and flexible, brands can pivot in mid-stride and position themselves in a manner their customers expect and demand. How can I use analytics to prove Twitter ROI? Now that you know how to use Twitter analytics to optimize social media campaigns, how can you prove its ROI to the rest of the organization? Many marketing analytics tools are capable of folding Twitter metrics into their reports and data visualization tools, including Google Analytics. Let’s do a quick examination of what overview-level metrics you’ll find in Google Analytics. Remember to do your research and make sure you prioritize metrics that are useful to your specific use case. Total number of sessions from Twitter: Number of visitors that come from Twitter links or cards. Goal revenue from Twitter: Amount of revenue attributed to a Twitter interaction. Goal completions from Twitter: Amount of desirable completed actions attributed to a Twitter interaction. Goal conversion rate from Twitter: Amount of conversions from Twitter compared against number of impressions. Total number of new users from Twitter: Number of new website or app users attributed to a Twitter interaction. Percent of new sessions from Twitter: How many of a certain number of new sessions are attributed to Twitter interactions. Metrics like the examples above give marketing managers and CMOs an accurate look into how much Twitter is contributing to the overall marketing plan. This makes Twitter a viable part of a revenue-driven marketing strategy; the channel can pull its own weight, and has the numbers to prove it. If you’re not already using Twitter analytics to optimize your marketing campaigns, then now is the perfect opportunity to begin. It may deliver new insights about your current marketing efforts and provide the means to create better content, forge stronger relationships, and improve your brand presence online. Want to measure your social media performance against industry benchmarks? Download your free copy of the 2017 Digital Marketing Analytics Performance Report now!